Three underwater documentaries are coming to Blu-ray's third dimension this June. 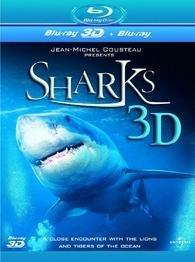 In an early announcement to retailers, Universal Studios has indicated that 'Dolphins and Whales - 3D,' 'Ocean Wonderland - 3D,' and 'Sharks - 3D' are planned for Blu-ray on June 7. Each release will also include the 2D version with 1080p video, a DTS-HD Master Audio 5.1 soundtrack, and no supplements have been revealed. Suggested list price for each Blu-ray 3D is $39.98. You can find the latest specs for 'Dolphins and Whales - 3D,' 'Ocean Wonderland - 3D,' and 'Sharks - 3D' linked from our Blu-ray Release Schedule, where they're indexed under June 7.